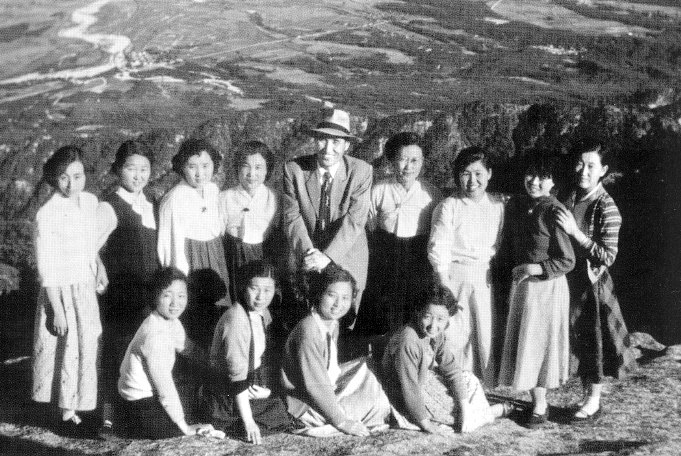 The following address was presented by Miss Young Oon Kim to the International Christian Fellowship Luncheon on October 6, 1971. It was given at the Church Center for the United Nations, 777 U.N. Plaza, New York City. Miss Kim is the founder of the Unification Church in the United States and Europe. Man has always delighted in examining ideas, in weighing one against another, and in ferreting out the internal contradictions of each. Man is fascinated by the paradoxical. No doubt this investigation has seldom failed to turn up the discrepancies and folly inherent in man's ideas. But surely no time has been so rich in paradox as our own day. Among you there are sure to be some who have noted the paradoxical quality of today's causes, pronouncements, aspirations and rebellions. For instance, with one breath someone advocates that nations cooperate to come to mutual solutions for world problems. In the next breath the same person canonizes the glorious individual and his supreme right to do his own thing. To elaborate, many people realize that to insure the survival of the world's nations and peoples -- all now faced with the possibility of nuclear destruction -- the attainment of a sense of unity among all powers is essential. It is surprising to hear the endless talk about peace and freedom on the world level or about the significance of all phases of international cooperation, be it political, economic, cultural or military. There is speculation on a world government. Some even dream of a single language for all peoples. America has furthered the development and survival of nations with its foreign aid program. Through the Peace Corps as well other nations have been served, U.S. armed forces have gone to help protect nations attacked by Communist forces. Such interaction initiated by America has fostered a sense of world community. Now, just when people are calling for unity, they are also demanding that America become isolationist, reduce foreign aid, and withdraw its military forces. Such is the paradoxical coexistence of the nationalistic and international viewpoints. Nor is the drive for Christian unity without its paradoxical elements. There is yearning for unity among denominations. The ecumenical movement has created inter-Protestant dialog and has succeeded in bringing the Roman Catholic and Greek Orthodox churches together -- in conversation if not theology. Though age-old hostilities have lessened and some mutual understanding results, true unity is still far away. Each group clings to its own coloration of Christian dogma and practice. The necessary genuine cooperative spirit is still lacking. When the various denominations and other religious people meet in that spirit, true unity and world peace won't be far. Meanwhile, we have the paradox of a single conference table at which to gossip about God but separate altars at which to worship Him. Such are the paradoxes of world and Christian unity: global interaction that becomes isolationist; shared concerns that aren't shared; and converging interests that seem to diverge. Nevertheless, some attempt toward unity is being made in both areas. Crowing this is the simultaneous surge of individualism. People seek disentanglement. They want to be free from every allegiance and do their thing. At the same time they call for world accord. We hear people say, 'I want to find myself, discover my identity." Then they turn inward and isolate themselves, all the while expecting nations and religions -- great, unwieldy bodies that they are -- to reach out and unite. A second example. Traditional ethical concepts hold little away with people today. Young people in particular rebel against conventional beliefs and seek desperately for some consistent meaning and philosophy of life; one with deep central values to fill their inner emptiness. Material things, sought after by people in the past, are lessening in appeal, as the new generation seeks a fresh spiritual path. In spite of this disenchantment with the past -- arid here lies the paradox -- we see mounting interest in what I might call the "lost past." There is great nostalgia for the pace of earlier times, and people are collecting all sorts of utensils that were used by their grandparents. People are making and doing things themselves, rather than buying them readymade. But most significant is the increased interest in man's deepest roots: his creation, his fall, the whole symbology of Adam and Eve and the Garden of Eden. These themes are much treated in current films and literature. It might be said that Alpha and Omega, the beginning and the end, have met in our age. Who believes Jesus was born without a father? Who believes he physically arose from his grave? Who believes he will float back in the flesh on a cloud? How many people believe that God purposefully sent his only son to die for mankind's salvation? If there is no belief here, what use has the Apostle's Creed to Christians? As these traditional dogmas are challenged, people are losing contact with the fundamental belief in God and divine providence, becoming atheistic. Just as congregations are dwindling, so are seminary enrollments. Even ordained priests and ministers are forsaking their vocations. Numerous seminaries, both Catholic and Protestant, are closing. Yet -- paradoxically--we see the emergence of new religions and cults. Their adherents often follow almost blindly, with devotion so strong as to appear fanatical. This, the Jesus movement attracts hundreds of thousands. Look at the Krishna movement and its dedicated young following. Buddhism and other eastern religions are increasingly prevalent in America. In every case followers are more -- not less -- fervent than average church members. So that though young people are irreligious from the Church standpoint, they are ardently 'religious outside it. They seek a new form of religion; a new concept of God; a new understanding of salvation. A fourth contradiction appears when we examine man's towering technological achievements. Surely this must be an age of pure science and reason. Man has unlocked atomic energy. Many causes of disease have been pinpointed. Cultured bacteria and viruses have yielded preventive vaccines to seemingly all- powerful scientists. Doctors transplant hearts. Computers have immeasurably expanded the capacity of the human brain. Mass communication and jet travel have brought the entire world into man's all-encompassing view, and he partakes of world events as a daily diet, as they happen. Not only have some men walked the moon, they have even taken the world with them via television and radio. Indeed, the power of technology seems limitless. But -- again "but" -- in this age of super-science, with its massive monuments to the tangible, people are seeking the spirit world. Perhaps this is natural, since with man's every achievement comes the threat of its misuse, such as atomic holocaust or biological warfare. And the closer world events come to man's daily life the more frightening it can be. Yet, for whatever reason, mankind looks for miracles and spiritual healing. Astrology commands a great audience. ESP claims the interest of countless people, clergy among them. Advice from the spirit world is sought by businessmen and statesmen. This is not to say that the operation of the spirit world is unscientific -- far from it. But -- in this age of reason -- man's faith in the spirit world increases. Is it not paradoxical? Next, what of youth's rebellion against established authority? Despite their notions of anarchy, young radicals paradoxically adopt a charismatic figure, a strong leader who can give clear- cut direction and clarify good and evil. Different groups venerate different heroes in this role. Among them are people like Mao Tse Tung, Che Guevara, Bobby Seale, Eldidge Cleaver, Fidel Castro, Kim Il Sung, and of course, Lenin. Perhaps the one thing each of the foregoing examples has in common is a puzzling cohabitation of hope and despair. A certain pessimism shading into nihilism characterizes our time. I've already mentioned the hovering nuclear threat. For nations already overcrowded population projections make for gloom. The ecological imbalance, the universal pollution -- air, land, water! All contribute to the pessimistic tone. The global breakdown of nature echoes the intimate disintegration of the family. Children and adults crave affection, love, loyalty and trust, but they are disappointed. Many face the ravages of cancer which begins with the crazing of a single cell and against which science is still helpless. Thus, despite all our medicine and technology, we find neither peace nor security. In this darkness many young people have lost a sense of direction and can distinguish no meaning in life. This can lead to drugs and self-destruction. For middle-aged people their loneliness and emptiness can lead to endless psychotherapy, alcohol, pep pills, tranquilizers, and in extreme instances, to suicide. Or it can lead, for other people, to determined search for some worthwhile cause to support. They look for the roots of new hope and direction much as we look for the first star as night deepens around us. I came to this country nearly thirteen years ago for a single purpose: to warn Americans of great confusion ahead, in which destructive forces will be most active. I came to awaken them to God's schedule and to show them the hour we have reached. I have been teaching that mankind is now entering a great transition. Though negative forces will be at their peak and present great hindrance, positive forces will nevertheless exert important influence. My topic, then, was the most unpopular of all: God. I taught that God did not just go into hibernation after his flings with the Old Testament prophets and with Jesus and his followers. God is even more active today than that. You can meet God more intensely, more intimately, more realistically than did St. Francis, or John Wesley, or George Fox. By meeting God, the source of life, you can find your true identity. Man can know who he is only in a relationship with God. In a deep and intimate relationship with God you can understand the meaning of your life, the reason and purpose of your being. Only by restoring man's relationship with God, can we achieve world peace and unity. All the dark signs and phenomena are the price man must pay for his accumulated sins and evils. I came to convey a strong faith and bright hope: that despite the pervasive despair God will bring about the realization of His promised world, the Kingdom of Heaven on earth. If the people in this country respond to the call of God and serve as His instrument, American will be blessed once again for another historical period. If the present generation does not respond, the prosperity you have will not last long, because you are reaping and enjoying the fruits that your dedicated ancestors have sown with sweat and blood. That historical period will come to an end. Hence it is the time to sow new seeds. Paradoxical signs and phenomena are the reflection and effects of much deeper causes which may not be recognized by many people. I have been pointing what the causes behind the confusion are, and spoken about the problem of coping with them. There are now groups of intelligent young people in various cities studying this teaching. They have tested is veracity as they apply it in their personal lives, in social problems, and in world situations. They now firmly believe that the teaching embodies the Truth, through which God is working. When one encounters God, he finds there all he has been seeking: love, hope, and purpose. His life changes inwardly and outwardly and his conviction grows day by day. Who in the world are strong, and who are happy? Aren't they those charged with strong conviction, and devoted to a noble cause? They have clear direction in life. They know how to channel their ideals, inspirations and energies. This I have seen in the past 12 years. I would like to invite you to meet those young people. They will be happy to share with you their joy and hope.